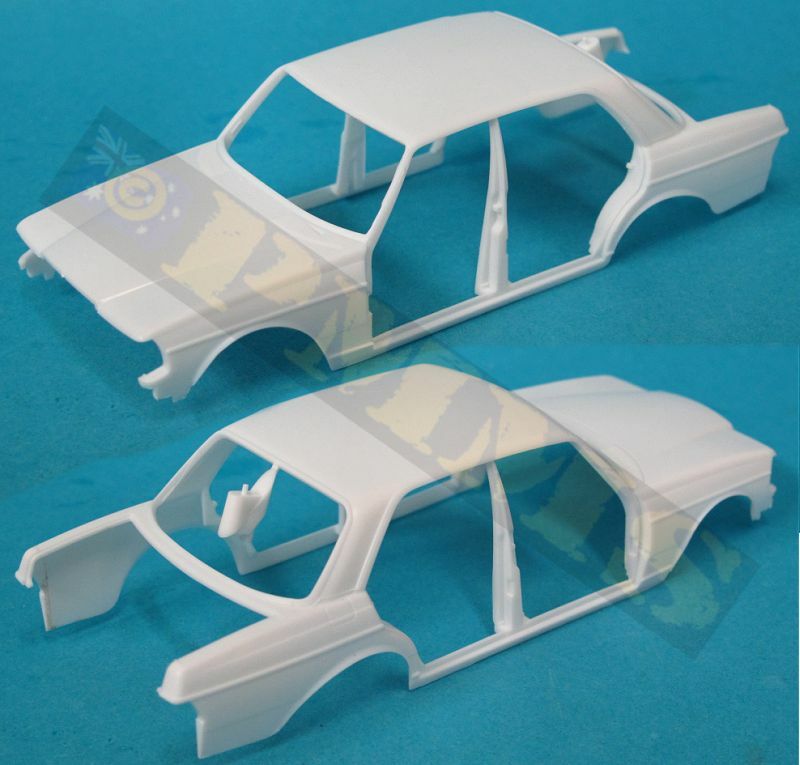 The W123 chassis Mercedes-Benz was built from 1976 to 1985 in various models, this new kit from Diopark represents a Mercedes-Benz 200D, but there is little visual difference between this and the 240D or 300D (D for diesel) These 200D, 240D and 300D models were very common in the Middle East which is the basis for the kit with the inclusion of the IED items. 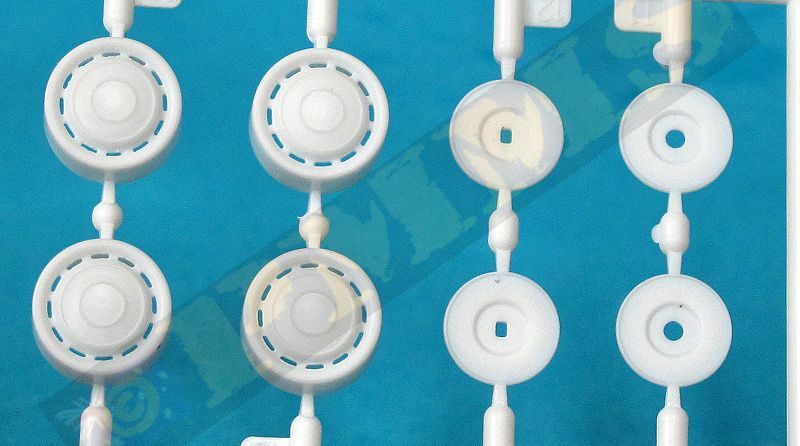 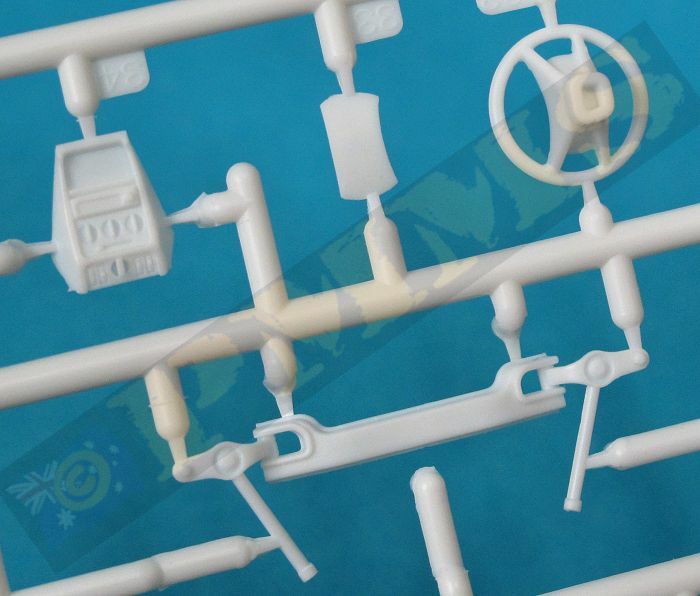 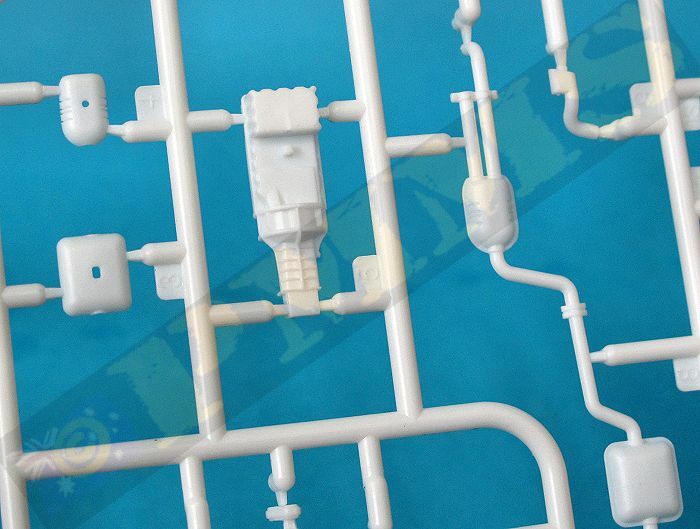 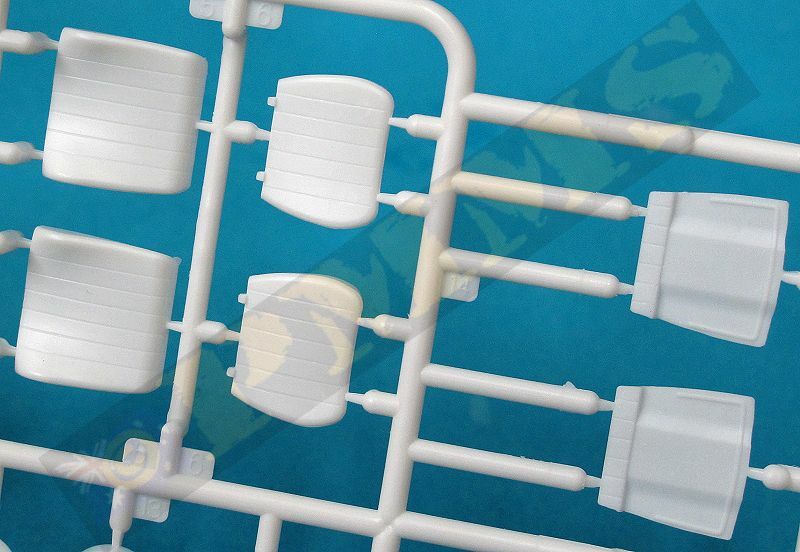 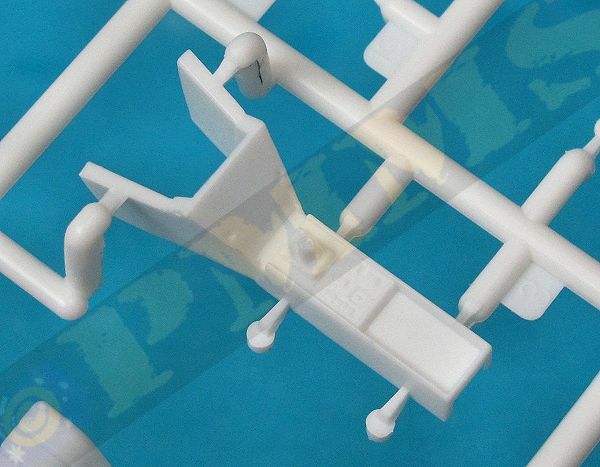 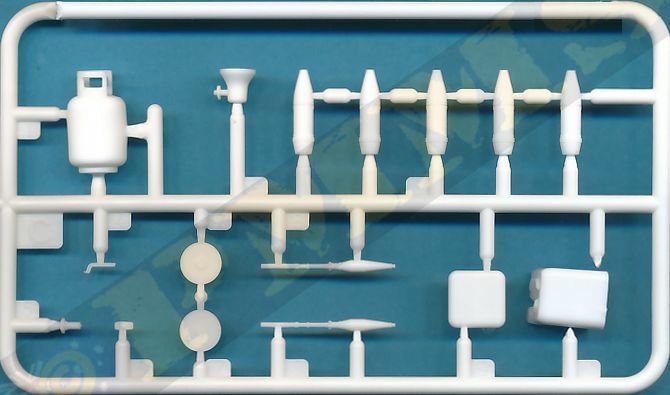 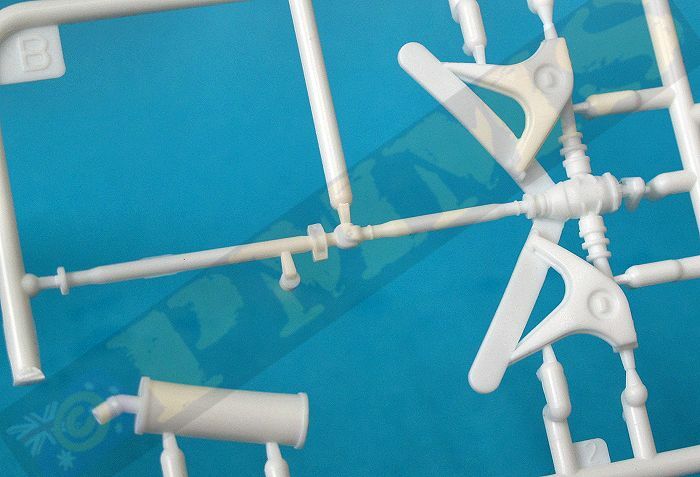 The standard of moulding is excellent with clean crisp details with virtually no visible pin marks and just the usual sprue burs and mould lines to be cleaned from the parts. 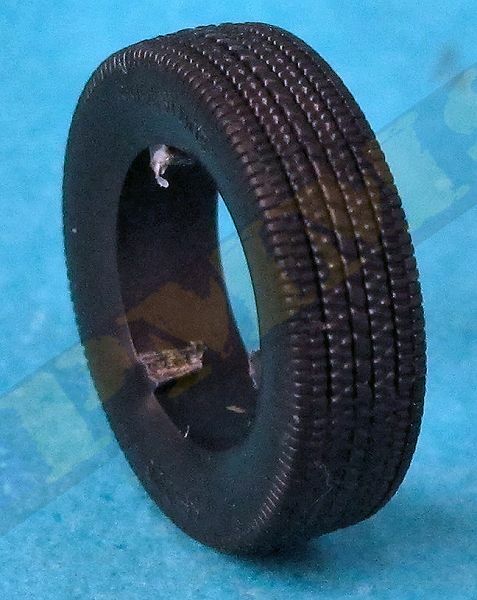 The clear part are quite thin and very clear without blemishes with the four tyres done in black plastic that feature excellent tread pattern and sidewall embossing of “RIUGESTUNE” which doesn’t stand for anything as far as I know and the data “SF-226” . 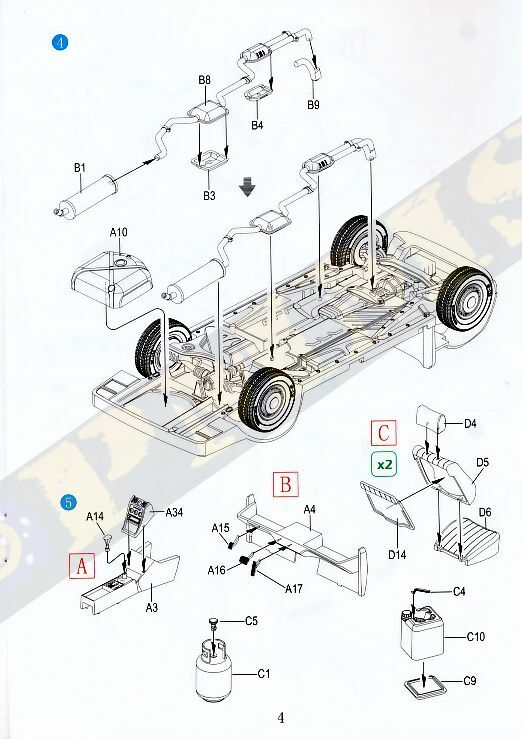 The large under pan/chassis is a single part with embossed detail on the underside to which is added the front wheel arches and engine firewall along with the lower section of the engine and suspension springs with additional parts for the front axle and steering linkages although these are rather simplified but do allow the front wheels to be positioned at any angle for animation of the wheels. 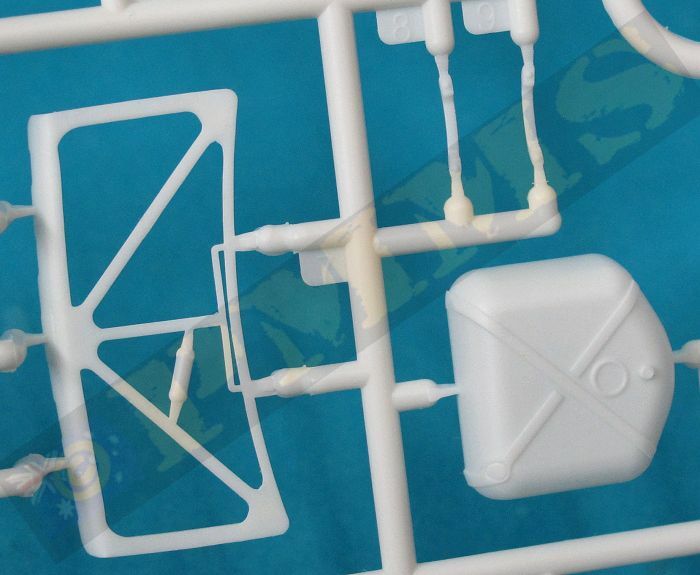 The front wheels have the rims with nice detail and additional etched stars for the hub caps with the wheel mounting lug glued through the brake disc to allow the wheel to rotate but care will be needed to not get glue where it shouldn’t be. 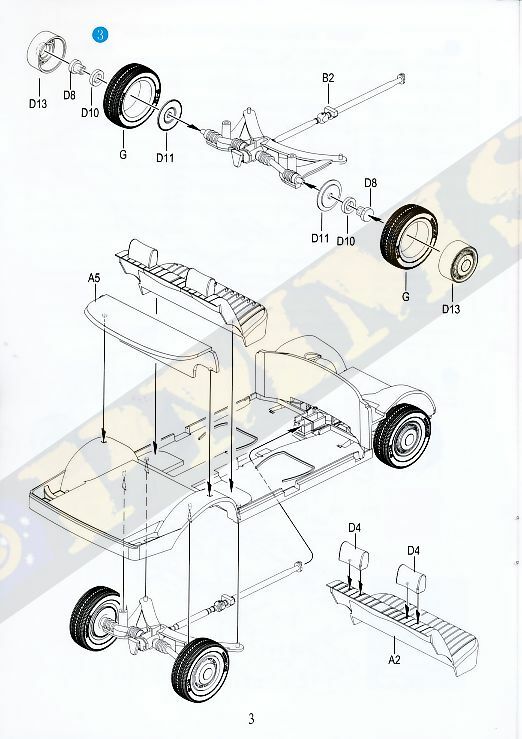 The rear axle/drive shaft is in one piece with the rear wheels assembling the same as the front apart from not being steerable obviously; the rear fuel tank and long exhaust pipe and muffler complete the underside details. 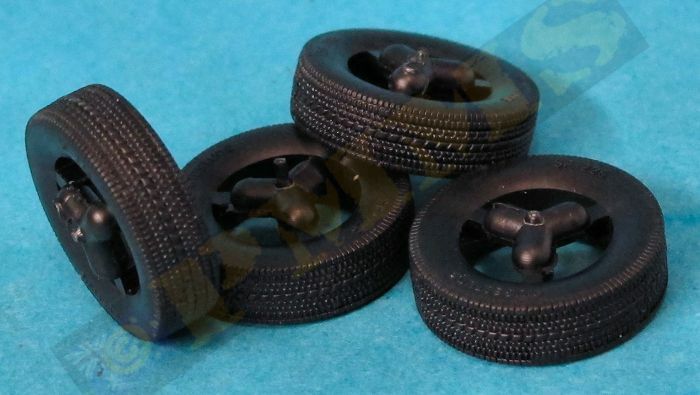 The tyres as mentioned are in normal black plastic with the civilian tread pattern and sidewall embossing and there are also six very fine mould lines diagonally across the tread pattern which isn’t that noticeable to the eye but care will be needed not to highlight these during weathering of the tyres. 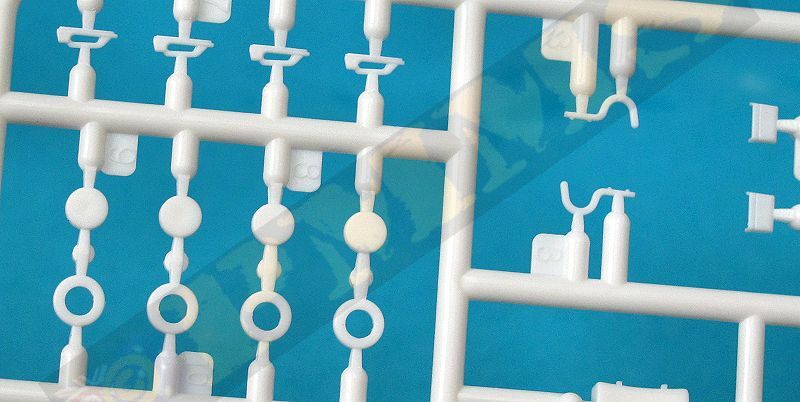 The sidewall embossing of “RIUGESTUNE” doesn’t stand for anything and can be left as is for effect or shaved off as you wish. 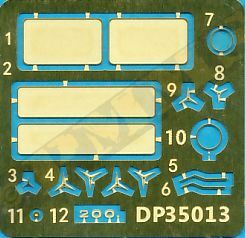 The wheel rims are nicely detailed with open holes around the outer rim and etched parts for the star on the centre hub for a nice appearance. 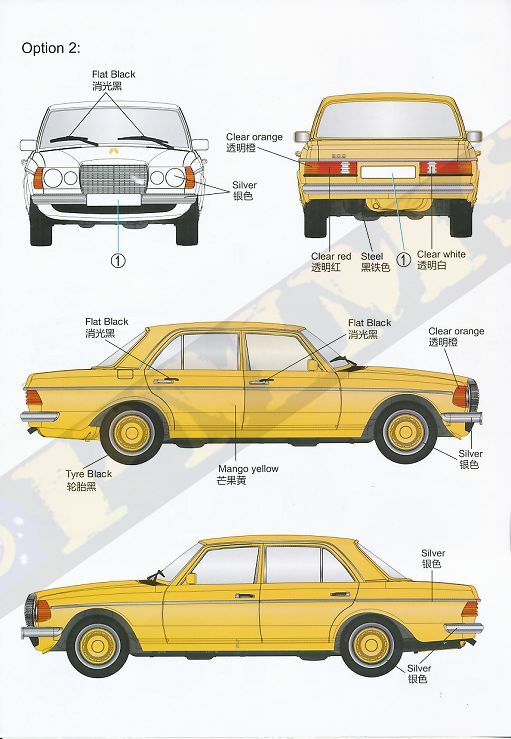 The fit of the rims inside the tyres is very tight and you may want to paint the rims first and fit the tyres last as you certainly won’t need any glue. 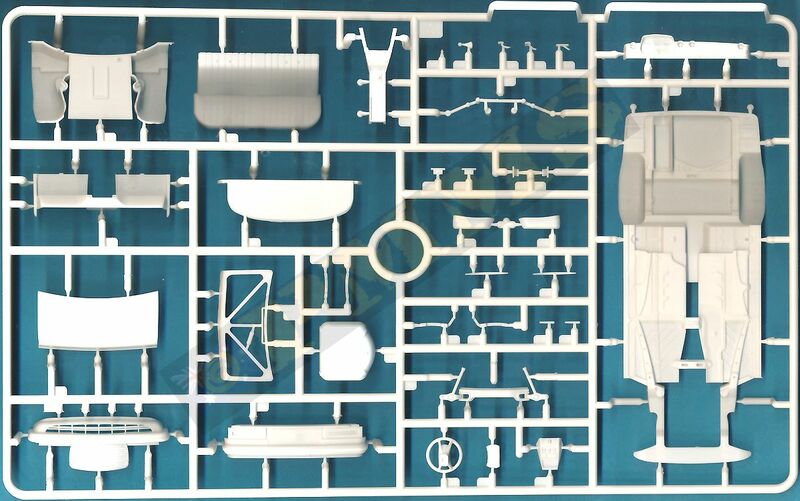 The main body shell is a single large moulding and comes packed in its own small cardboard box to protect from any damage in transit, the four passenger doors are separate as is the rear luggage compartment door and the front and rear panels. 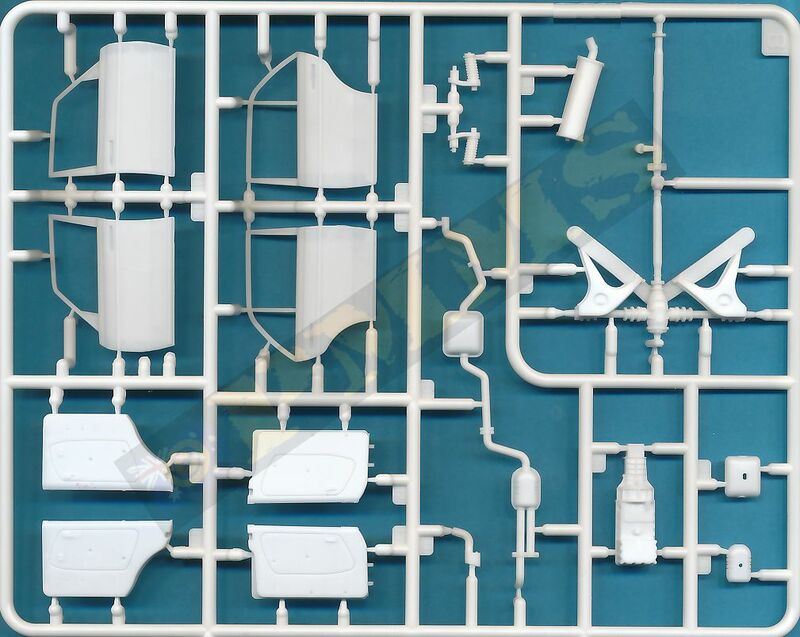 You should note if building the kit as the Police car option that you must open up the three roof locating holes from the inside for the lights and siren before anything else. 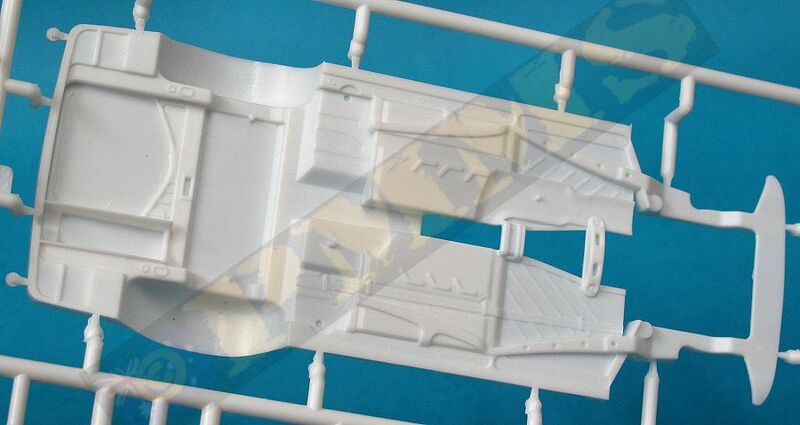 The luggage compartment door has separate inner strengthening bars for good detail if showing the door open and this comes with separate hinges to make fitting open or closed easy. 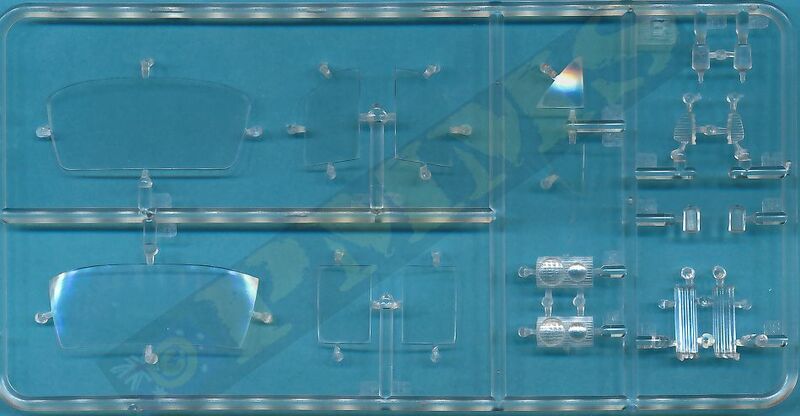 The clear “glass” windshield and rear window sit flush inside the body cut-outs and you will need to be careful with the glue to not compromise the clear glass while gluing. 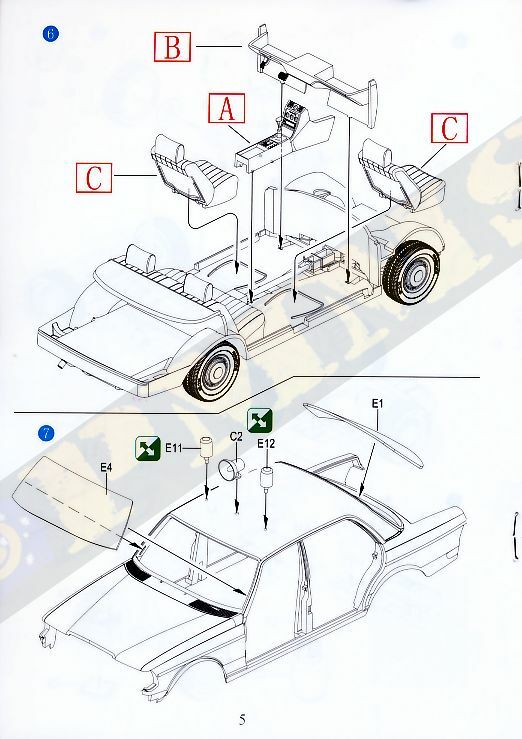 The separate rear panel has large clear plastic lights and etched number plate with this fitting to main body and the front bumper and lower inlet cover as well as the distinctive Benz radiator all in one piece with clear double headlights and side indicators with this fitting to the front of the body. 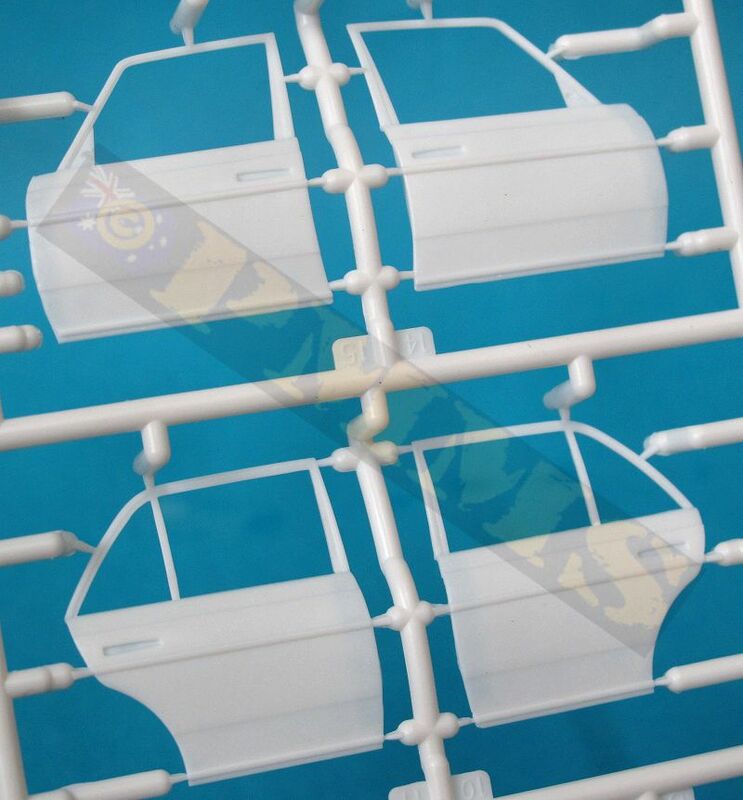 The windscreen wipers are made up of two plastic and one etched part each for good definition but care will be needed assembling these. 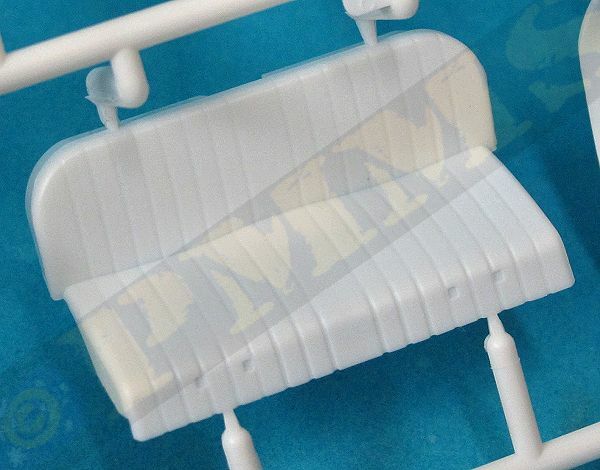 The interior has the rear bench seat and shelf added along with the front bucket seats in two halves (seat and backrest) as well as separate head restraints, these all have nice cushion texture and fit directly to the floor. 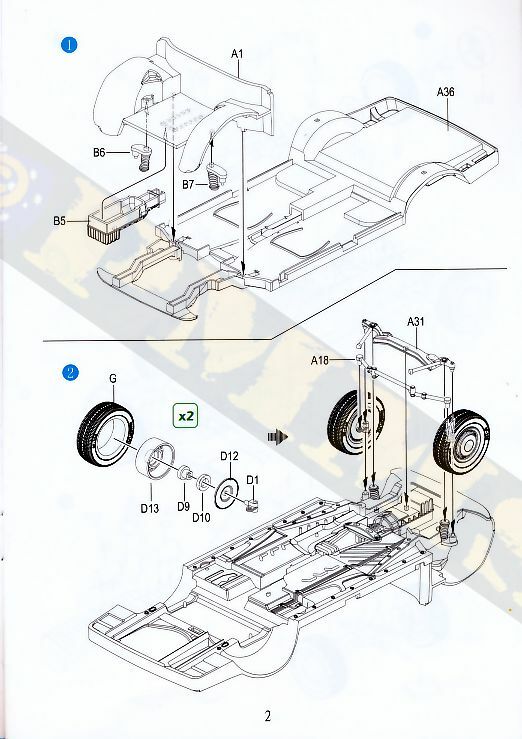 The two part central console has nice detail with separate gear lever and the lower forward bulkhead with separate foot pedals. 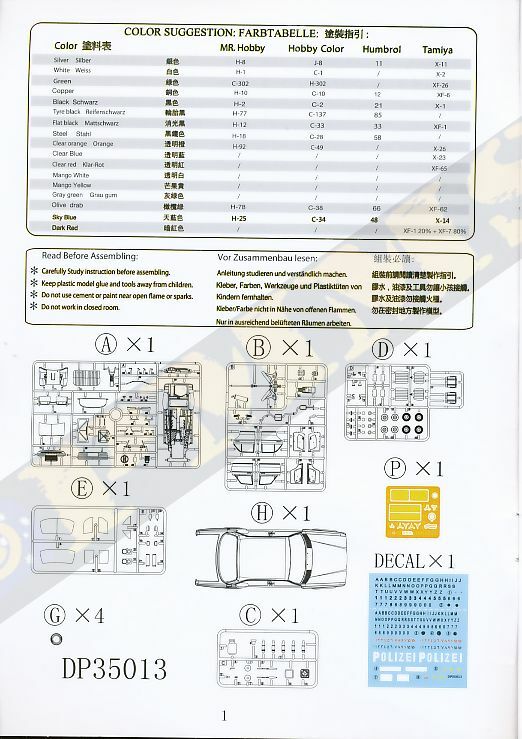 The LHD main instrument panel is again nicely detailed with the air conditioning outlets having very good definition and decals provided for the instrument dials along with separate two part steering wheel. 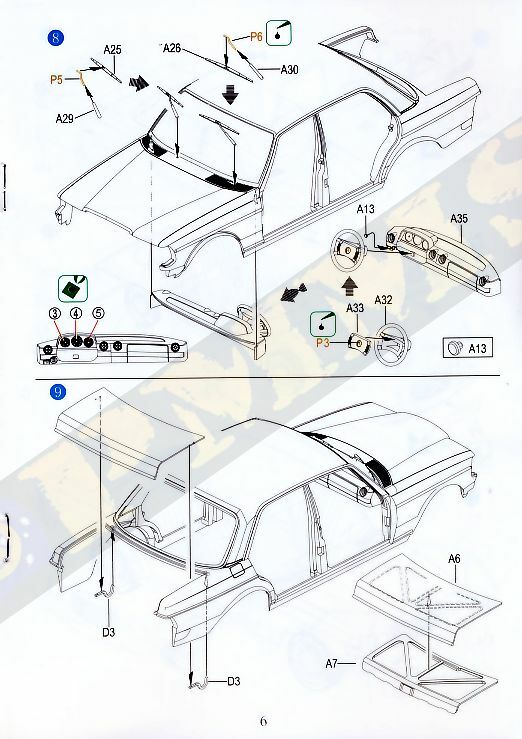 The separate side doors have the outer shell and inner lining panel as separate parts, when fitting these together there is a small hinge part that allows you to fit the doors in the open of closed position, other details include separate arm rests and grab handles inside the doors with separate front wing mirrors and outside door handles on all four doors. 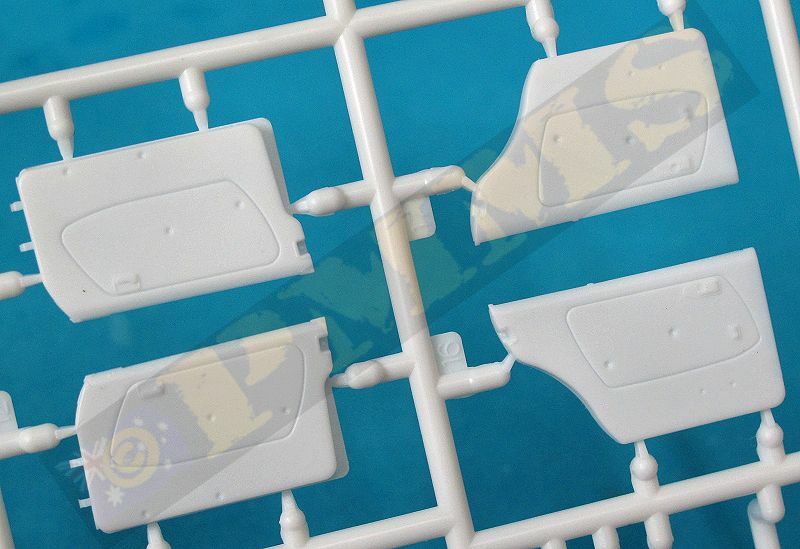 The window ‘glass’ again fits flush inside the openings and care will needed with the glue, if you want show the windows open you will need to cut the ‘glass’ parts down for the required effect. 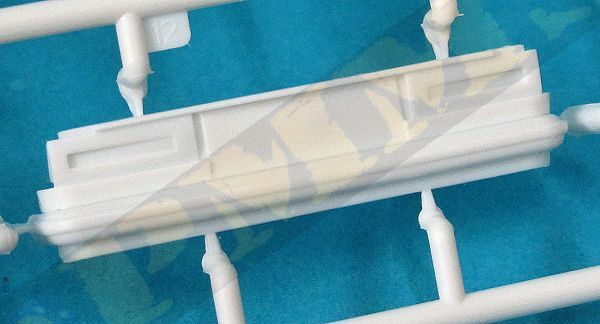 Etched parts are provided for the MB stars for the front radiator and the hood adornment, this is in three very small parts, the outer circle, the star and small mounting so care will be needed as this will be extremely fragile and it’s best to add this at the very last. 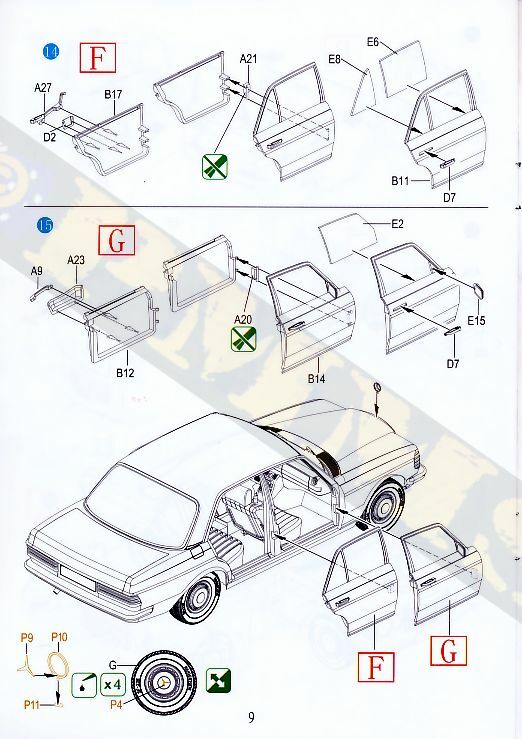 The circle and star for the rear compartment door is also provided with separate ring and star but as this fits flush onto the door there shouldn’t be any problems in fitting. 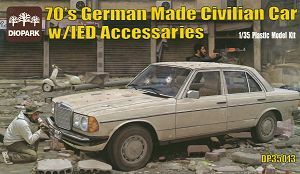 The IED items in the kit include two TM-62M mines, two RPG rockets, 5 155mm artillery rounds, a mobile phone, plastic petrol container and a metal LPG gas bottle to use as you see fit in a diorama setting. 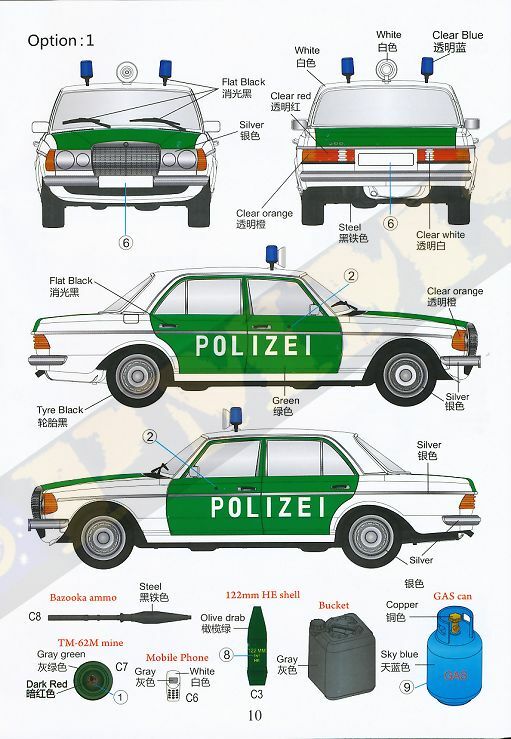 The decal sheet provides markings for one German Police car in green and white with the large “POLIZEI” for the sides as well as one generic civilian vehicle in yellow but you could finish this in any colour you want really. 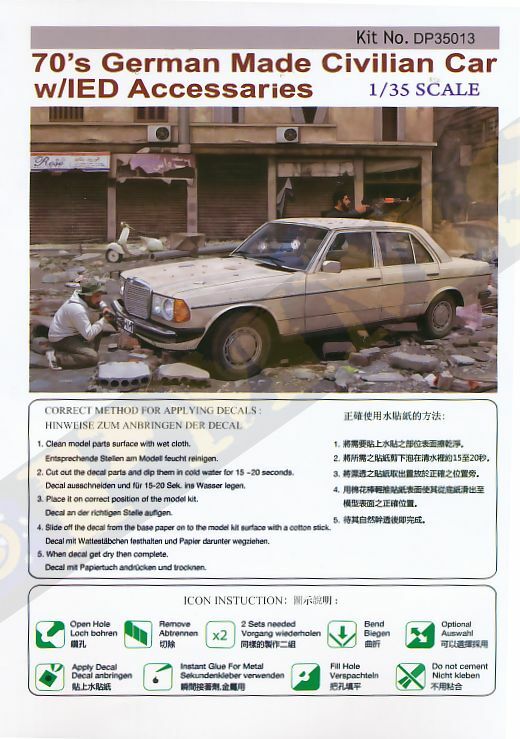 The decal sheet has a large selection of alpha characters and numbers for the number plates with some in Arabic for a Middle Eastern car. 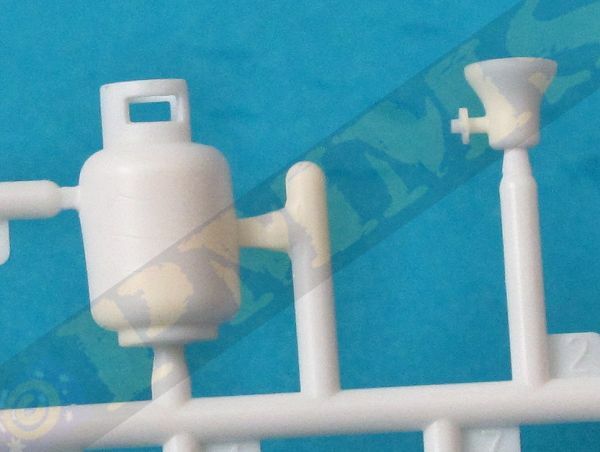 Additional decals are for the 155mm stencilling and the gas bottle. 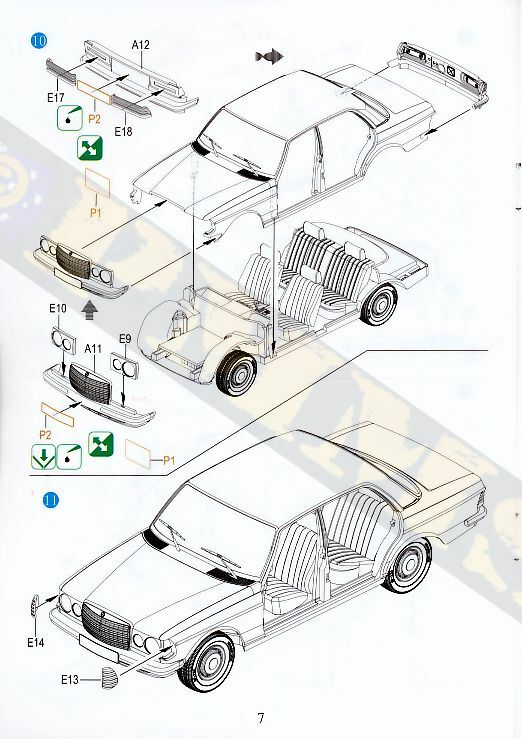 The instruction booklet has standard exploded view drawings that are easy to follow given there isn‘t a lot of parts but as with any you should study these beforehand to avoid any problems. 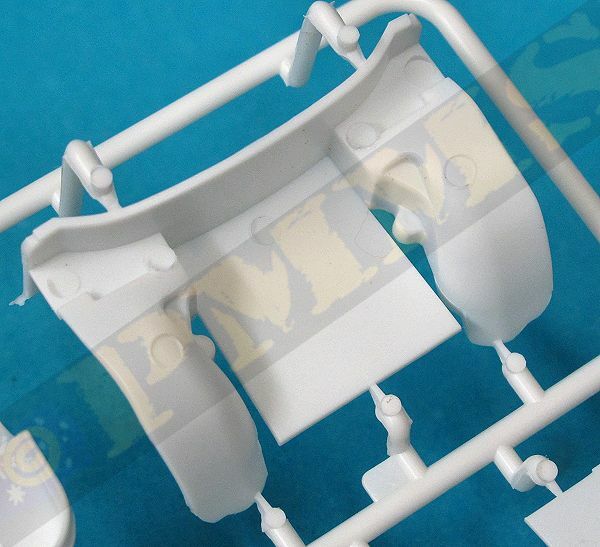 Paint numbers are given for Mr.Hobby, Hobby Color, Humbrol and Tamiya paints. 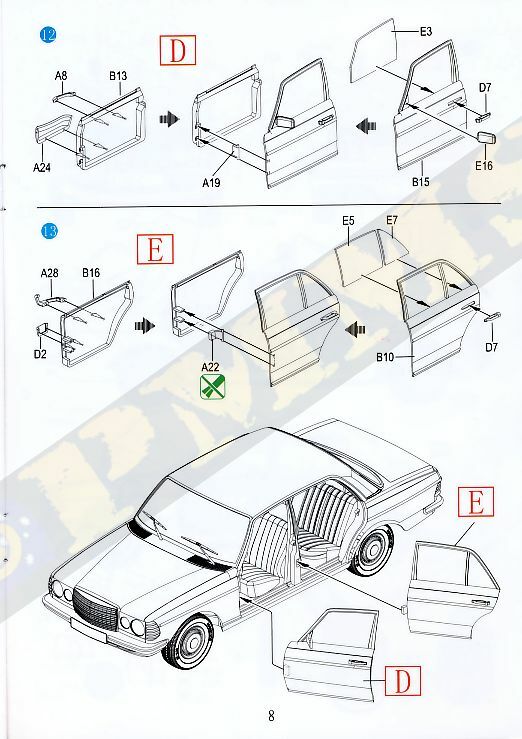 This looks to be an excellent kit of the classis MB sedan with good clean mouldings and nice detail on the parts, the separate doors and luggage compartment allow for any variety of configurations and along with fairly straightforward assembly for an attractive model. 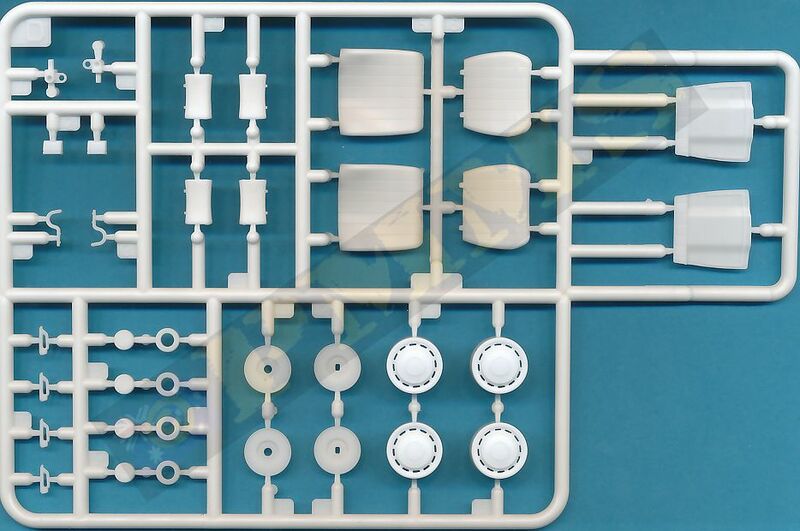 It is good to see more modern civilian vehicles in 1:35 scale and this kit can be used in any setting as it was widely used throughout the World but most likely will find its way into Middle Eastern dioramas as intended.